We called Mason Goodrich Thompson III, “Shorty.” He was 6’5” and you couldn’t miss him in a crowd at the Montgomery County fair, even if you were blind. He stood out. Mason came back from Korea with a set of skills; he could make anything explode. When the church went up in smoke and those poor kids in the choir were set ablaze, the police, the silent newspaper reporters, the whole town knew who did it. But Mason never stood trial, at least not in my lifetime. Worked at the Cadillac dealership, selling brand new Caddys his whole life—like nothing happened. Made a pile of money. So much money, people said his wife had seven different nannies. Brad Rose was born and raised in southern California and lives in Boston. His book of poetry and micro fiction, Pink X-Ray, will be available from Big Table Publishing, Spring, 2015. Brad’s poetry and fiction have appeared in The Los Angeles Times, Posit, The Baltimore Review, San Pedro River Review, Off the Coast, Third Wednesday, Boston Literary Magazine, Right Hand Pointing, and other publications. Links to Brad’s published poetry and fiction can be found at: bradrosepoetry.blogspot.com. His chapbook of miniature fiction, Coyotes Circle the Party Store, can be read at: sites.google.com/site/bradroserhpchapbook. Lead image: Airline Terminal, Atlanta, Georgia, 1956. 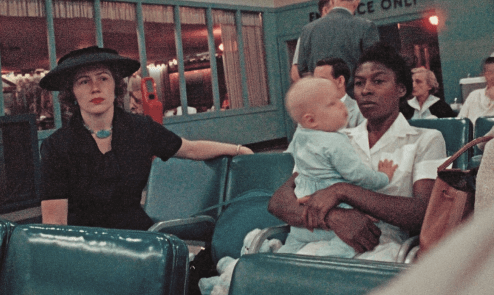 Photograph by Gordon Parks. Courtesy of and copyright The Gordon Parks Foundation. This is so sharp, so sweet, so smartly and economically written, I just wanted to shout More! So disappointed to reach the end so soon. Feels like it could be an opening to a longer piece, set in a small town, following the lives of ordinary but extraordinary people. Nice work.